Hello everyone. It's FRIDAY!!! I know a few of you are beyond happy about that. LOL. Today starts Carnival here in Brasil. First up is Sao Paulo City and then Rio. The whole country comes to a complete standstill. Next week the post office and banks are closed Monday, Tuesday and Wednesday! Crazy but fun. Here is one more card for Valentine's Day using the same 3D technique as my card from February 9th. Hope you like. It's very easy to make. (1) The card size is A2 (4.25" x 5.5"). Cut a strip of patterned paper - 3/4" x 5.25" - and adhere to card front. (1) O tamanho do cartão é A2. Corte uma tira de papel decorado - 3/4 "x 5.25" - e cole na parte dianteira do cartão. (2) Cut two pieces of white cardstock - 3.4" x 5.25" and 2.5" x 5.25". Place pop dots on the back of each piece. Adhere the smaller piece to the right of the patterned paper and the other piece to the left of the patterned paper. (2) Corte dois pedaços de cardstock branca - 3,4" x 5,25" e 2,5" x 5,25". Coloque fita banana na parte traseira de cada peça. Aderir a peça menor para a direita do papel decorado e a outra parte para a esquerda do papel decorado. 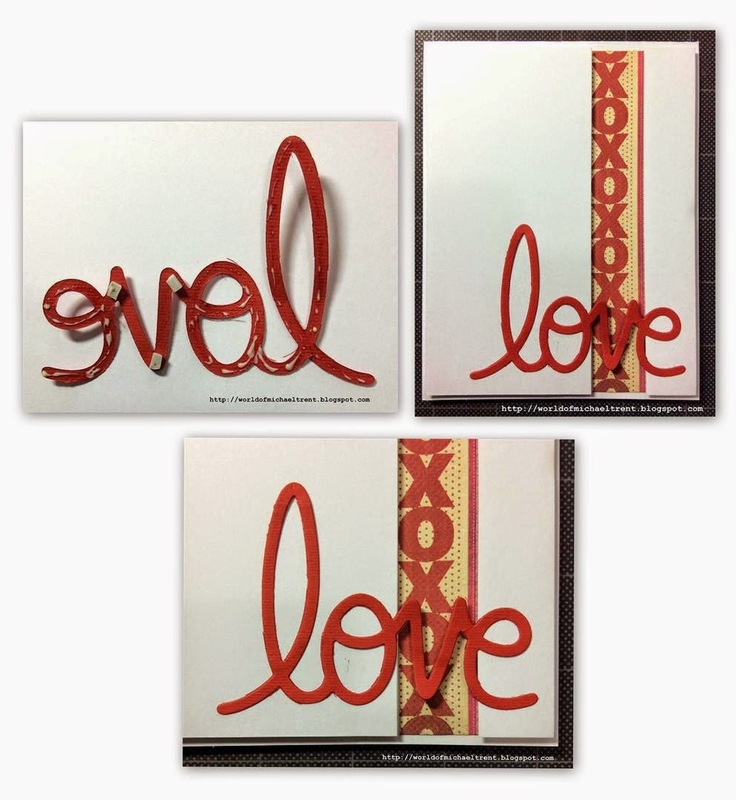 (3) Cut the "love" diecut out of red cardstock. Adhere glue to the back and pieces of pop dot where you know it will cover the patterned paper. Adhere to card front. (3) Corte a faca "amor" de cardstock vermelha. Cole cola na parte de trás os pedaços de fita banana onde você sabe que vai cobrir o papel decorado. Cole na parte dianteira do cartão. (4) Apply some Diamond Glaze over the phrase. Adhere some heart embellishments. Allow all to dry. (4) Aplique um pouco de Diamond Glaze ou Dimensional Relevo 3D Incolor sobre a frase. Cole alguns embellishments tipo coracoes. Deixe secar. Today's card was made to enter into the black, white and red color challenge over at Can You Case It? 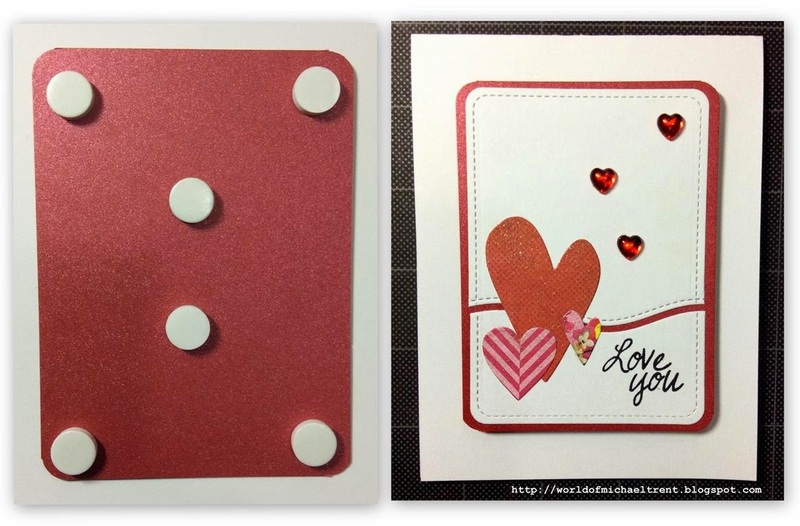 Make an A2 card base out of textured red cardstock. Adhere the black cardstock to the card front. Then adhere the white cardstock to the black. 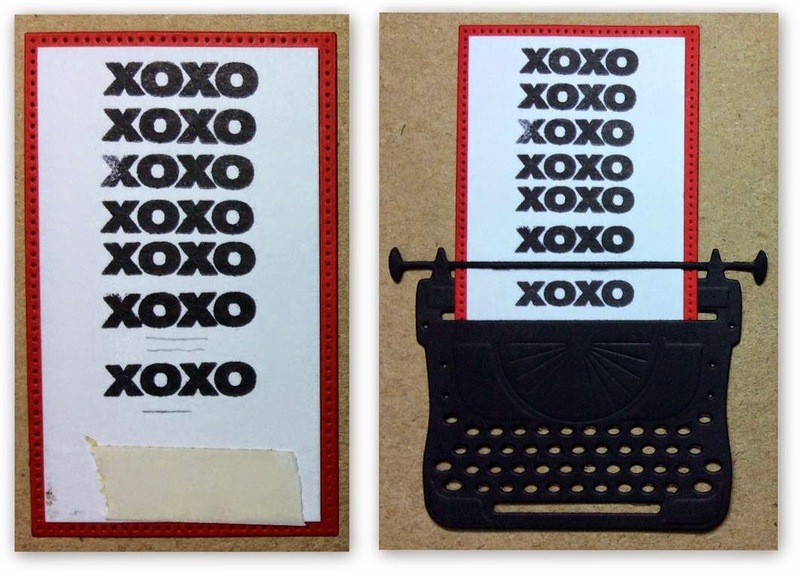 Using your die cut machine, cut and then emboss the Typewriter die out of black cardstock. Cut a piece of red cardstock with the 4th largest die from the Pierced Rectangle STAX. Adhere the 1.75" x 3" white cardstock to the piece you just cut. Place a piece of double sided tape at the bottom (don't remove the top piece yet). Now, slip this piece through the typewriter so that it sits just above where the keys start (look at the back). Make three marks with a pencil so that you will know where to stamp your phrase. Remove the piece and, using a stamp positioner, stamp your phrase. Then stamp above the pencil lines. 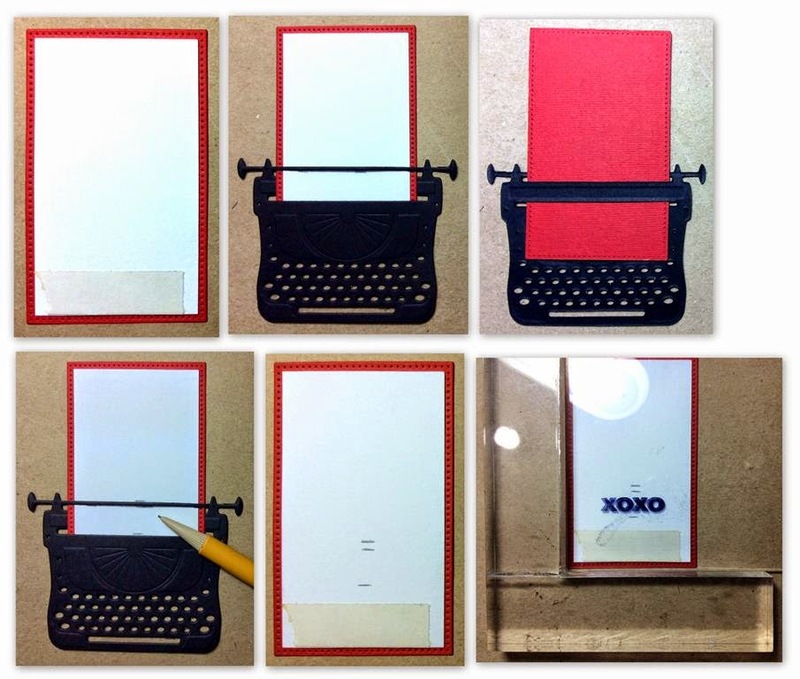 Erase the pencil lines, remove the adhesive to the double sided tape, slip it back into the typewriter. Apply some pop dots to the back, above the keys, and some glue to the area around the keys. Then glue to the front of your card. Adhere the keys area first and then push down. The area with the pop dots will bend to give you some depth to the typewriter. 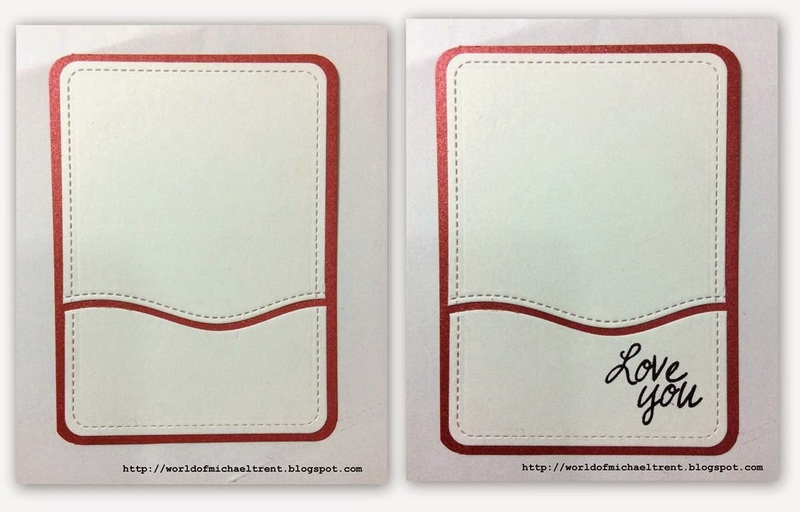 Now just adhere a piece of 4" x 5.25" cardstock to the inside - to write on - and give it someone special! Hope you liked this card. Let me know what you think! White Cardstock - 3.75"x5", 1.75"x3", and 4"x5.25"
Good morning everyone! Since I am 3 hours ahead of NY, the Grammy Awards did not start until 11pm. I tried - I really tried - to get through the whole show but I crashed at 1am. Was nice to wake up to find out that Sam Smith won 4 awards! Now I hope that this brings him some happiness and his next album will be a bit more upbeat. HA! Did you guys watch? Today I have another easy Valentine's Day card. The color scheme is black, red and white. I am also going to enter this card into the Can You Case It Color Challenge this week that is black, red and white. Perfect timing. If you want to enter their challenge you can check out their website at canyoucaseit.com. (1) Make card base. Cut a piece of patterned Valentine's Day paper and adhere it - 4" in from the right side of the card. (2) Apply pop dots or foam tape to the back of each of the pieces of white cardstock. (3) Adhere the smaller piece of white cardstock to the right side of the patterned paper. Make sure you keep a 1/8" border. Then adhere the larger size on the left side of the paper. 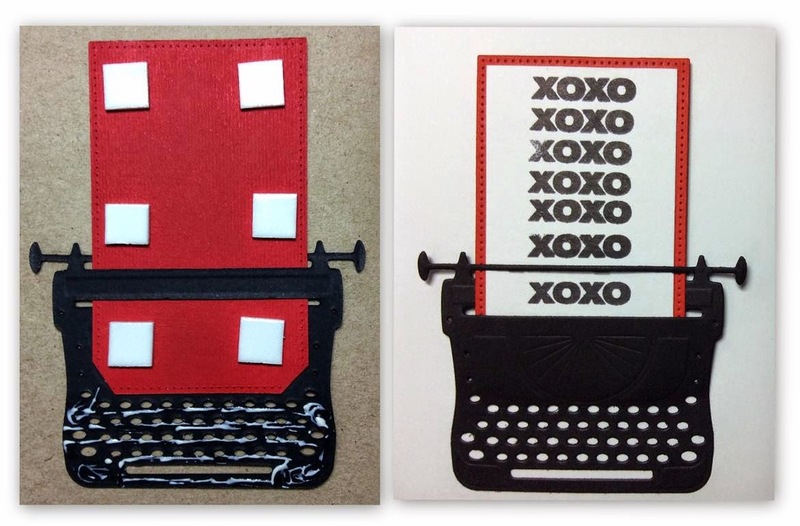 (4) Die cut the Love die two times - once out of black cardstock and once out of red cardstock. Cut small pieces of foam tape or pop dots and adhere to the back of the "o" and the "v" and then adhere glue to the rest. Adhere the phrase to the front of the card positioning the "o" and the "v" over the patterned paper. Then adhere the hearts cut from the red cardstock to the front. (5) Last - I applied some Frosted Lace Stickles to the hearts! Done. Now just sign the card and give it to someone that will appreciate a handmade card! Hope you enjoyed this card. Let me know if you make any! Piece of patterned paper - 2.5" x 4.75"
Piece of white cardstock - 1.5" x 4.75"
Piece of white cardstock - 3" x 4.75"
Hello everyone. Hope y'all are having a great weekend! 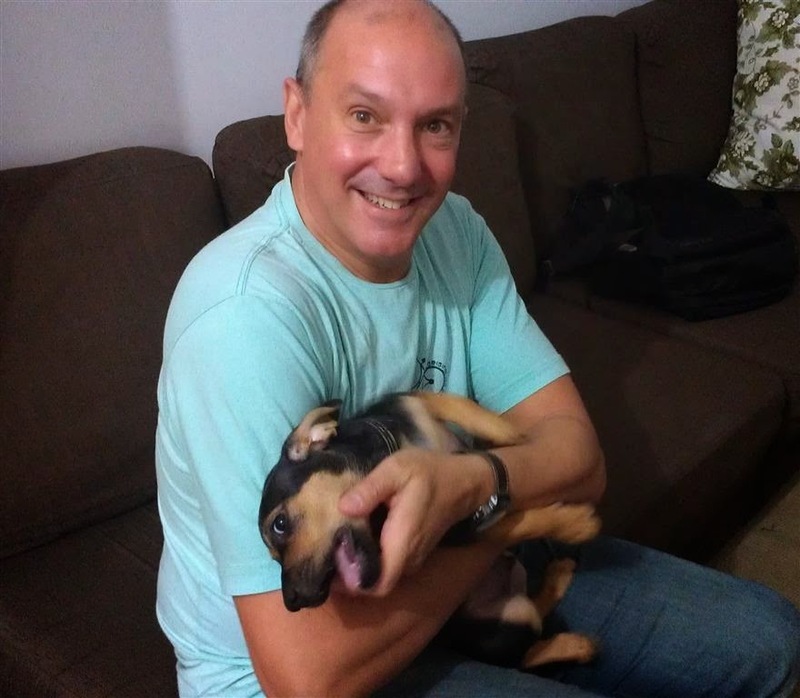 Yesterday Ruy and I went into Sao Paulo and met some friends for a day of fun and to see Whiskey! He went nuts when he saw us and, as much as he missed Ruy, he missed me more. LOL. He was pretty much in my arms for most of the morning! Barbara loves him and Whiskey is really loving his new home. Check out his smile below! Today I am showing another Valentine's Day card. Seriously, you can make this card in under 15 minutes! I love love love this background from MFT and the "XO" letters go perfectly with it. Below was the first card I made. I cut the "X" and the "O" from black cardstock but when I applied the Crystal Stickles, they turned it a nice green patina, which I kinda like. Also, my friend Sue suggested I not put a flower on the top as it hides both hearts and to keep them red and white, not pink. I remade the card for this step by step and I changed the letters to white cardstock. I also played around with the flowers. At the very bottom is another example without any flowers. Hope you guys like. (1). 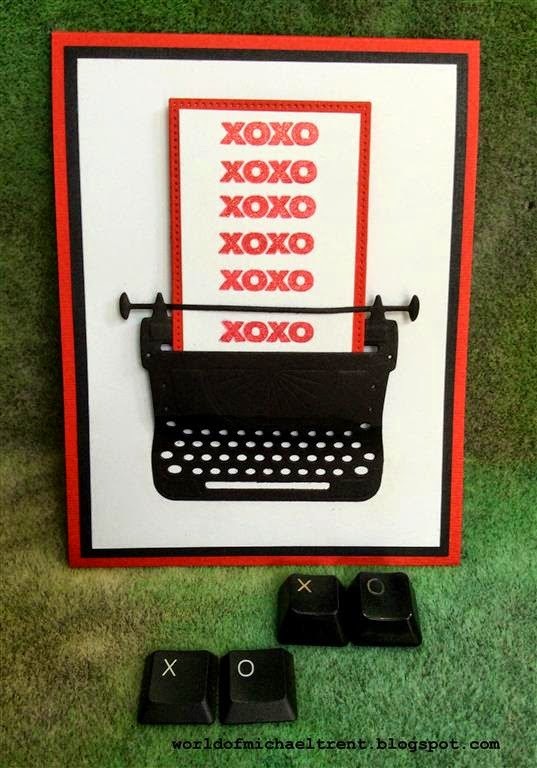 Grab your die cut machine and cut the Hugs & Kisses background die from the 4.25" x 5.5" piece of white cardstock. Cut the "X" and the "O" from the Round-A-Bout Alphabet set from the scrap piece of white cardstock. Cut the largest heart die from the Heart Die Set - 2 from a red cardstock scrap and 2 from a black cardstock scrap. 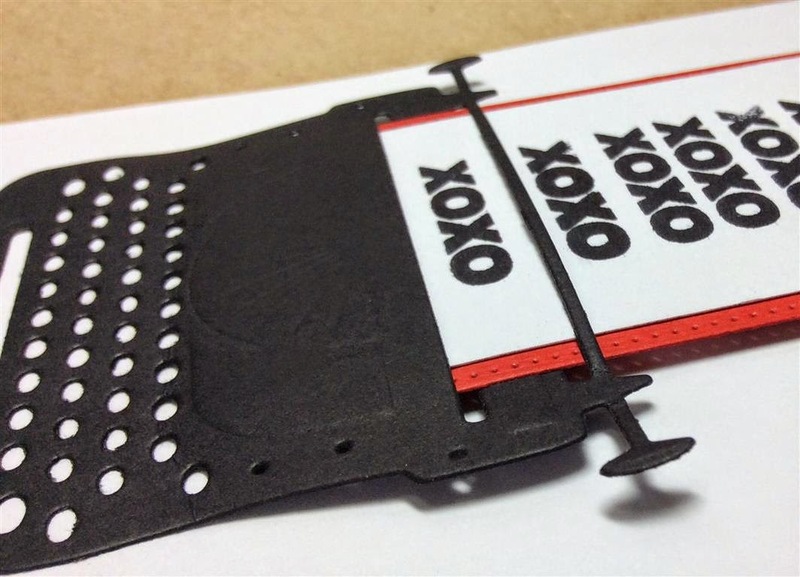 (2) Glue the XO background to the red card front. Then glue one red heart over a black heart but leave a small amount of the black cardstock showing. This gives a bit of a shadow and will give some depth to the hearts. 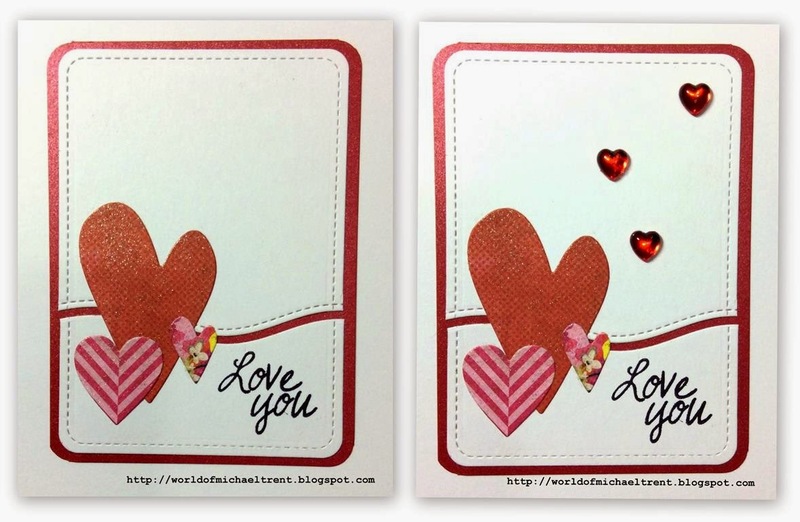 (3) Put some pop dots or foam tape on the back of the hearts and adhere them to the card front towards the lower right corner. Then glue the "X" and the "O" on the hearts. (4) Apply the Crystal Stickles on top of the "X" and the "O" to give it some sparkle. Then glue the roses around the bottom of the hearts. I use a liquid glue that will dry clear to adhere the roses. OR - leave the roses off! I hope you guys liked this step by step. Let me know which card you loved the most. Below is a list of the supplies I used. Check back tomorrow for another Valentine's Day card! Hey everyone. I see that my old city is being hammered once again with snow...snow..and more snow. I miss big snow storms like that. Here it is raining...raining...raining. But we still need it. Our city is doing much better but the city of Sao Paulo is going to start rationing water soon. Scary. Today I have another Valentine's Day card. But it can really be used for any day. No reason to limit saying "I Love You" to just Valentine's Day. Right? 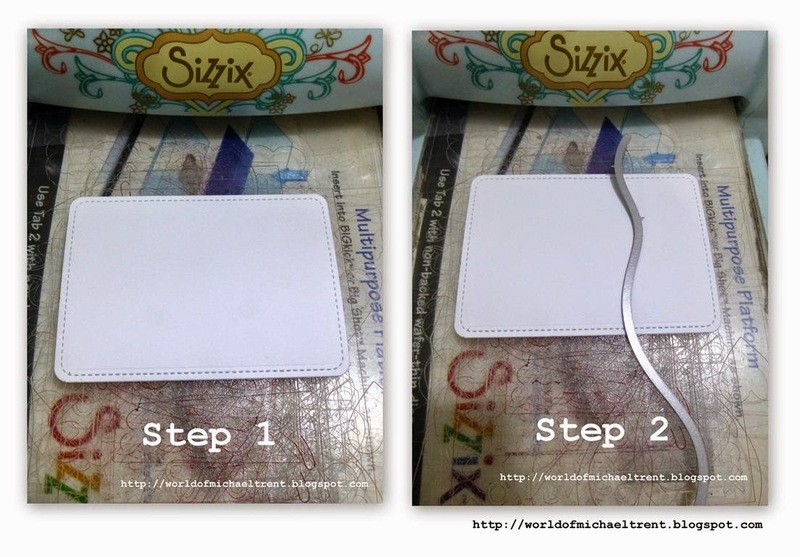 (1) Grab your die cut machine and cut the Stitched Journaling Card with white cardstock. Then lay one of the dies from the Stitched Hillside Border set about 3/4" down from the top and cut again. You will end up with two pieces. (2) Cut a piece of red cardstock 3 1/8" x 4 1/4" and round all 4 corners with 1/4" side of the Corner Chomper. Adhere the 2 white cardstock pieces to the red cardstock - leaving a space between the two pieces. Then stamp the phrase Love You from the Bottom of My Heart set in the lower right corner. (3) Cut 3 of the heart dies out of scraps of nice paper and adhere to the card front, next to the phrase. Apply "Clear" Wink of Stella Brush pen over the hearts to give it some shimmer. Then adhere 3 small heart embellishments to the card front. Allow to dry. (4) Put a few pop dots on the back of the piece and adhere to the card front. Now sign it and send it to someone you love! !